I love reading I always have for as long as I can remember, I got into reading at a young age mainly because my dad is a massive reader he’s always got at least one book on the go! I did go a few years where I barely read but then I met my Mother in Law who told me about the books she likes to read which got my interest so she lent me book 1 in a series and it was all downhill from there! 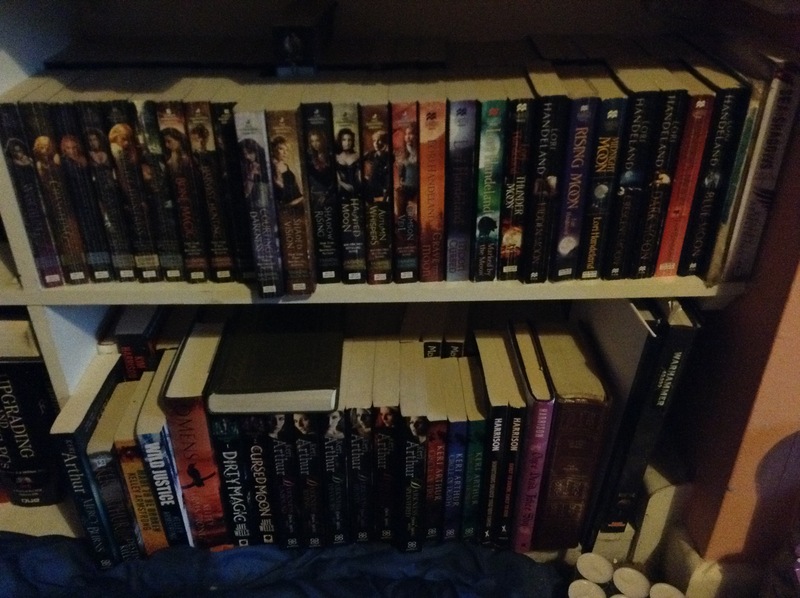 Since that day my book collection has expanded to 2 shelves with 2 books deep on each shelf, with several authors and a lot of series, if I were to count how many books I own im guessing there would be over 100 and that doesn’t include all the books I have on Fairies or on the Kindle!! I mainly read Urban Fantasy books but I do have some Young Adult series and 2 Crime series, well 1 Adult Mystery and 1 Crime/Urban Fantasy. Below are my Top 5 Authors and the series of theirs that i have read and have enjoyed. – Riley Jenson Guardian Series – 9 Books in total- Dark Angel Series – 6 Books so far, Book 7 and final in the series is out 2nd December this year! Keri Arthur does have a few other series but I haven’t read them, if or when i do read them I’ll add them to the list. Yasmine Galenorn does have a few other series out but I have not read them. – Anita Blake Series – 24 Books so far, Book 25 is out 2nd December this year, i have only read up to book 4 so far but am planning on reading the rest when i finish getting them all! – Merry Gentry Series – 9 Books that I know of not sure if she’s writing more in this series will just have to wait and see, I also haven’t finished reading this series I’ve only read the first 2 books so far but am planning on reading the rest. – The Hollows Series – 12 Books so far, Book 13 is out 28th April 2015, so far I’ve only just started this series but I do have most of the books ready to be read. If you have read any of these authors which series are your favourite? and can you recommend any authors you like? I’d love to hear from you about your favourite authors.